This volume of Reviews in Mineralogy attempts to synthesize our present understanding of certain aspects of the mineralogy and chemistry of the rock-forming carbonates. Hopefully, it reflects the presently more active areas of research. 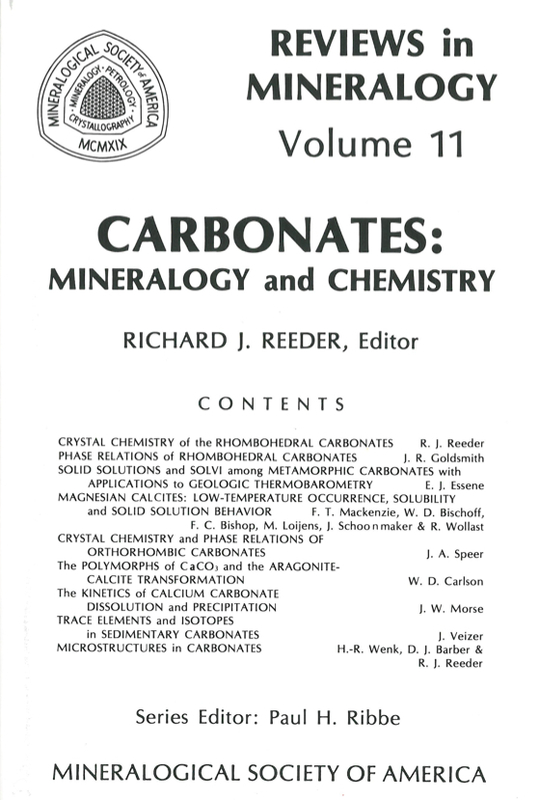 This review follows, by ten years, a major assessment of (sedimentary) carbonate minerals by Lippmann (1973). There is only minor overlap of subject material, and I hope that this difference reflects fairly how this field has developed. In some respects carbonates are unique, for they are one of the few mineral groups providing an abundant record of biological, physical, and chemical processes throughout much of geologic time. Because of their relative importance in sedimentary rocks, lowtemperature examples are given more emphasis here. Moreover, the obvious correlation with energy resources has been a significant factor contributing to the current resurgence of interest in this area. However, the broader interest in carbonates is also a reflection of their widespread occurrence in vastly different geologic environments, including metamorphic and igneous settings, as well as an appreciation of their role in both atmospheric and oceanic chemistry, both past and present. In this volume, some of the papers are general (i.e., those addressing crystal chemistry and phase relations), and they provide overviews of a fundamental nature and are of interest to many. Others are more specialized in coverage and generally reflect the different approaches used in carbonate geochemistry. The final chapter introduces transmission electron microscopy, a relatively new and powerful technique for mineralogical research that has great potential in carbonate research. Owing to the short time interval between the completion of manuscripts and publication, much of the newer material in this volume is still "fresh." The various reviewers, all gratefully acknowledged, were expeditious in their efforts. A hurried schedule, however, allows for unnoticed errors to persist; these should be brought to my attention. Interest in carbonate research has continued at an ever-hurried pace since this book was first printed. While the individual chapters could not be revised in this second printing to include the many new findings, a partial listing of noteworthy papers that have since appeared are given in an Appendix at the end of the volume (p. 395-399). These papers are arranged by chapters corresponding roughly to the subject area discussed. In addition, incomplete references from the first printing are listed in this appendix. The assistance of the authors and especially of Paul Ribbe is greatly appreciated. Several years ago, Rich Reeder, who was and still is very excited about new vistas of research centered around application of the transmission electron microscope to carbonates, volunteered to organize a short course on carbonates for the Mineralogical Society of America. His success is commemorated by this volume with its fifteen authors, nine of whom lectured October 28-30, 1983, just prior to the annual meetings of M.S.A. and the Geological Society of America at Indianapolis, Indiana.